This commodious five-bedroom villa at the Palms At Park housing compound offers five-star accommodations and convenience, but with all the space and comforts of a family home. It also features magnificent views of the San Jacinto Mountains. The layout, vibe, and location were perfect for our extended family of ten. The kitchen and grill were perfect to eat in and avoid the Easter crowds. We had a wonderful time! 5 STARS - What a Gorgeous Home! 5 STARS - 40th Birthday Celebration Success! This experience was a success from start to finish. The owners were helpful, responsive and a pleasure to work with. We rented the two Villas for 5 days with 16 friends and everyone enjoyed the house from start to finish. Everyone who was involved in the upkeep of the house (cleaners, trash removal, pool maintenance) were professional and pleasant. I would 100% recommend this property to my friends to rent. Palm Springs was lovely! This house really is brand new and beautiful! The mountain views are to die for. All of the bedrooms have their own bathrooms. The place was immaculately clean and beautifully decorated- we loved the original art. The wide open kitchen/dining room/living room with wood ceiling looks like something straight out of Dwell Magazine. This was a very different experience from our last vacation in Palm Springs in an old house with bad air conditioning and dirty carpets. You won’t want to leave the pool, it was like our private 5 star resort. Weloved the tanning shelf and that you can really swim good long laps in the pool! It only took 5 minutes to get to restaurants and downtown. David was very helpful prior to our arrival. My family and I and I really didn't want to leave this magical place and are already making plans to come back! 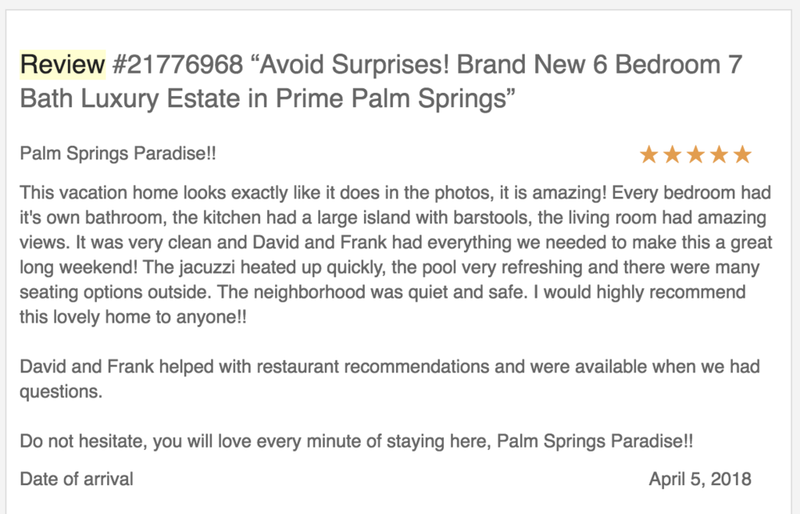 5 STARS - The perfect vacation! Amazing girls trip! The house was beautiful with stunning views. More then enough room for all of us. Loved the kitchen and pool! 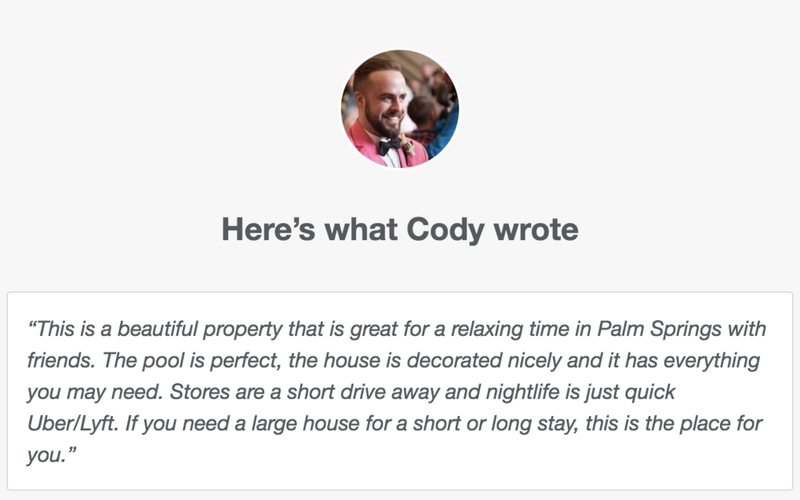 Everything was super clean when we checked in and the owners are great to work with. Can’t wait to go back! This property is super cool! If you want a true LA experience (which my husband and I did) this house is perfect! It’s clean, modern and chic! Kitchen is incredible! I’m definitely coming back! Oh and I had a question about the house and I was immediately replied to! Thanks for the memories LA!!! Loved it!